With its long cultural ties to the Pacific region, outrigger canoe paddling is not something most New Yorkers think of when contemplating their city’s waterways. And yet for almost 20 years, visitors to Manhattan’s Hudson River Park have found outrigger canoes traveling along the city’s shores. Throughout June 2014, videographers from the New York Times followed NYO’s mixed gender team “Big Apple Ohana” as they trained for the Hawaiian Airlines Liberty Challenge, considered one of the world’s most prestigious international outrigger events and the largest Pacific Island festival on the East Coast. 2014 Hawaiian Airlines Liberty Challenge, featured on NBC New York Directors of the Hawaiian Airlines Liberty Challenge were invited to NBC New York to spread the word about the unique features of the race. 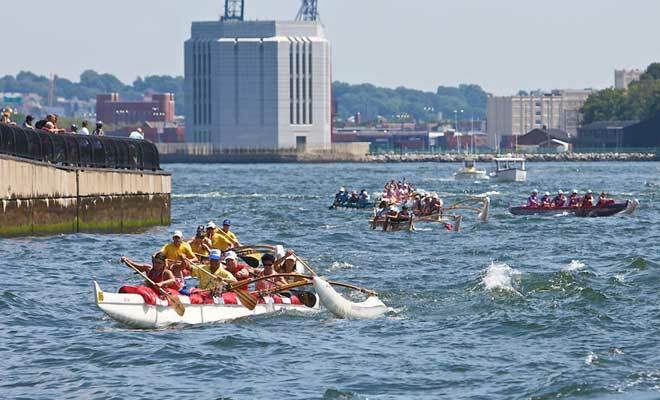 Communications Director Keith Tsang speaks with Roseanne Colletti to discuss the origins of outrigger canoe paddling, its spread around the world and the unique urban features of the race setting in New York Harbor. The 2012 Hawaiian Airlines Liberty Challenge is currently featured on the latest episode of Ocean Paddler TV. The Hawaiian Airlines Liberty Challenge hosted by New York Outrigger is the premier outrigger racing event on the Eastern Seaboard and is quickly becoming recognized as one of the most unique races in the international outrigger racing circuit. This year's race drew paddlers from around the world including Australia, Brazil, Canada, France, Italy, and Panama as well as from all over the United States including Hawaii, California, Texas, Arizona, Florida and the East Coast. Ocean Paddler TV captures the unique qualities of this race, its amazing location in New York Harbor in the shadow of the Statue of Liberty and the new One World Trade Center and the aloha spirit that is thriving on the East Coast through the sport of outrigger paddling. See the Ocean Paddler TV Facebook Page for a Teaser of the Liberty Challenge Episode. Many thanks to our 2012 Media Sponsor Olukai and our partner sponsor Hawaiian Airlines for making this broadcast possible. Ocean Paddler #51 featuring the Hawaiian Airlines Liberty Challenge will air in Hawaii throughout the month of August on OC16. For the rest of the United States, Ocean Paddler # 51 will air on Universal Sports Network, available on Direct TV Channel 625 and Dish Channel 402. Check your local listings. If you are flying Hawaiian Airlines soon, be sure to watch a condensed version of this episode on their in-flight entertainment on Hawaiian Skies. Hawaiian paddlers on the Hudson River in Big Apple - surreal! The Hawaiian Airlines Liberty Challenge hosted by New York Outrigger has been named to Time Out New York's list of 101 Things to Do in the Summer in New York City 2012. The events listed in the highly-anticipated annual Summer issue are chosen amongst thousands of events by Time Out New York Editors. Listed alongside the Hawaiian Airlines Liberty Challenge include such events as a visit to the newly arrived Space Shuttle Enterprise and to major sporting events including the U.S. Open and the New York Yankees. 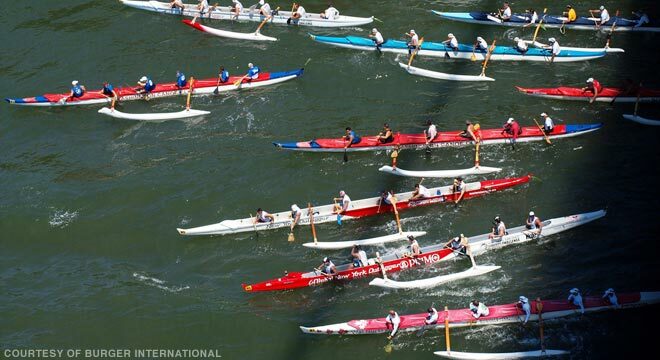 The 16th annual Hawaiian Airlines Liberty Challenge on Saturday, June 23rd is one of the largest sporting events on New York Harbor and one of the most prestigious outrigger canoe races in the world. This year's list of competitors include top international teams representing France, Brazil, Panama and Canada along with elite teams in the United States from Hawaii, California, Arizona and the Eastern Seaboard. Many festivities and promotions are planned for this year's race including a free film screening of I Just Love to Paddle in association with the Patagonia Soho Store on Thursday, June 21st. On race day, you can meet the crews from around the globe as they launch their canoes at Brooklyn Bridge Park. There are many opportunities to view the race along the race course including at viewing stations set up at Pier 25 and Pier 62 in Hudson River Park where you can cheer for your favorite crew as they make their way up the Hudson River. Finally, congratulate the winning teams and join in on the Hawaiian feast at the Liberty Luau at the Frying Pan/Pier 66 Maritime. For those residents of the Tri-State area that may want to race in a future Liberty Challenge, you can start by signing up for free New York Outrigger Novice Sessions held most weekends throughout the summer at Pier 66 Boathouse in Hudson River Park. NEW YORK >> Team Hawaii has no peer at the Liberty World Challenge outrigger canoe race. Hawaii won the men's division of the paddling event yesterday in New York City for the fifth consecutive year. Hawaii won the race, which has been run six straight years, in 1 hour, 57 minutes, 25 seconds -- more than eight minutes ahead of the closest competitor. The 14-mile course passes Governors' Island, the Statue of Liberty and Ellis Island before finishing at Pier 84. Nine countries, and 100 teams, were represented in the race, including the United States, Australia, Japan, Tahiti, Brazil and Germany. Members of Team Hawaii were James Foti, John Foti, Mike Judd, Thiebert Lusia'a, Keali'i Pa'aina and Walter Guild, the team captain and manager. Newport Aquatic Center (Calif.) finished second in the race in 2:05.38 and Manuiwa (Conn.) placed third in 2:07.56. Team Hawaii did not send a women's team to the Liberty World Challenge this year. Offshore Canoe Club (Calif.) won the women's event in 2:16.05. Team Hawaii returns to the islands tomorrow. In a spectacle of endurance and speed more commonly seen in the turquoise ocean waters of Polynesia, dozens of paddling teams raced outrigger canoes through the steely gray swells of New York Harbor yesterday. NEW YORK (CNN) -- They came, they rowed, and -- perhaps -- they conquered. Teams of six in outrigger canoes, paddling a daunting course. Not along the shorelines of Bali or Oahu or Pago Pago, but around lower Manhattan. Under Lady Liberty's astonished gaze, and with historic Ellis Island as a backdrop, New York held its first-ever international outrigger canoe race this weekend. Teams from Maine to Florida took part in the contest. Of course, New York was represented, too. No matter that the local team initially had a hard time finding enough paddlers. Organizers scoured local gyms and found athletes willing to give the sport a whirl. Outrigging is nothing new, of course. It dates back some 2,000 years, originating in the islands that dot the southern, western and central Pacific Ocean. The sport involves six-person teams paddling in perfect unison. The first person in the canoe sets the pace, and the other team members match his or her strokes. The canoe itself measures 45 feet (13.6 meters), and is made of wood or -- in this high-tech age -- Fiberglas. Its narrow 18-inch (46-centimeter) hull is stabilized by an outrigger, also called an ama. Outrigging enthusiasts say that while the sport is technically not very difficult, it builds up a great sense of participation. As in kayaking and other canoeing activities, each team member literally pulls his or her own weight. What sets outrigging apart, say enthusiasts, is that it takes place in the sea -- and the unpredictability of the waves gives the sport that extra thrill. In recent years, outrigging has been increasingly popular in Australia, Hawaii and even the west coast of the United States. Now outrigging advocates hope the International Olympic Committee takes notice. They want their sport to become the next Olympic water event, perhaps in time for the 2000 Summer Games in Sydney. CNN's Cynthia Tornquist contributed to this report.